Common and Scientific Names — Common names are easiest for public reference but scientific names are critical to ensure that plant selection and ordering is accurate. Regional Native Status — All listed states have been verified through the USDA Plant Database and the Flora of Nebraska, 2007. The region includes Nebraska, South Dakota, Minnesota, Iowa, Illinois, Missouri, Kansas, Wyoming, and Colorado. This list assigns native status based on plant species, which does not technically include cultivars or hybrids. Exposure — Full sun means a minimum of six to eight hours of sunlight per day. Part shade is three to six hours of direct sunlight per day or filtered sunlight all day. Full shade is less than three hours of direct sunlight per day. Soil Type — Categories include sand, loam, or clay. 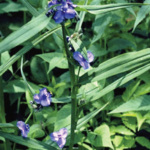 For use as a general factor in plant selection and indicator of plant adaptability to poor soil conditions. Soil Moisture — Ranges from wet to dry. For use as a general classification to match plants to conditions. Recommended Garden Location — Correlates to soil moisture information and ability to tolerate standing water in the garden. Ponding duration can vary widely. Plants recommended for garden sides may also be adaptable to bottom areas of the garden where water naturally infiltrates quickly. Approximate Mature Height — Plants are listed by categories ranging from groundcover to more than 60 inches for perennials and grasses, and from 2 to 3 feet to more than 15 feet for shrubs. Approximate Mature Spread — Plants are listed by categories ranging from 6 inches to more than 60 inches for perennials and grasses, and from 1 to 2 feet to more than 10 feet for shrubs. interest. Shrubs are noted for flower season, fall color and winter interest. Comments and Cautions — Additional information based on personal experiences of manual authors and contributors. In particular, carefully consider whether to use plants that lean or may be too tall for small gardens, or tend to appear weedy, aggressive or invasive. Alternative Species and Cultivars — Provides additional choices in plants that fill similar garden roles, expand flower colors or have special characteristics, may be easier to locate in the trade, etc.